My list view has just 1 or 2 datas , but still it shows empty rows till the end of the page . This just happens in ios ., in android its working fine . can this also be achieved by XAML now that we also have FooterTemplate available in 1.4? Yes, I have attached a sample demonstrating this. You can wrap your ListView in a StackLayout and the extra lines is gone, easy way only negativ about it, is the scrolling is done in its container and not the full screen. Odd , it was still there for me. but here it is again. made the empty rows show again, so I am not sure what might be going on on your end. Can you post your full XAML code? Using the strategy posted by @TorbenKruse all of the extra cells were eliminated, but yet a large blank area remains that contains the same background color of which the ListView was assigned. The blank area persists exactly where the blank cells would have been located - right underneath the ListView. I have the ListView in a StackLayout with other Views underneath the ListView and the large, 'blank', colored area is still a hindrance aesthetically. Is there any possible way to remove that as well, or is anyone else running into this problem? Thanks. @Jordanjhewitt Set the list view background color to whatever you want the "empty" background color to be, then set the individual cell background color to white, or whatever cell background color you want. I imagine you could also go with a transparent background color for the list view, in which case it would show the parent background color instead. But it will only hide the lines. Sometime is below the list like button or anything then user have to scroll. Turn off the separator lines: SeparatorVisibility = "None", then draw your own using a BoxView with height set to 1 and Color set to #B2B2B2 or whatever shade of gray you like. Do this in your ViewCell. No need for empty Footer and this gives you more control of the separators as far as color and margin goes. I've validated it is NOT data in my binding class Property ("Desc"). My complete answer is on that thread. But it's fairly simple / sensical to me and doesn't involve a huge hack. Add a read only property to your view model class which will control the height and make the getter look at your ObservableCollection's .Count property of whatever your ListView's ItemSource. You want to make sure, PropertyChangedEventHandler is raised whenever your ListView items change count. Add a call to your PropertyChangedEventHandler in the setter of your viewModel's ObservableCollection that you're using to populate the list. Bind HeightRequest in the XAML to said new property. Overall, pretty easy if your'e following MVVM from the get-go. Clean, and easy to follow for others looking at your code, but still probably wondering why it's there. 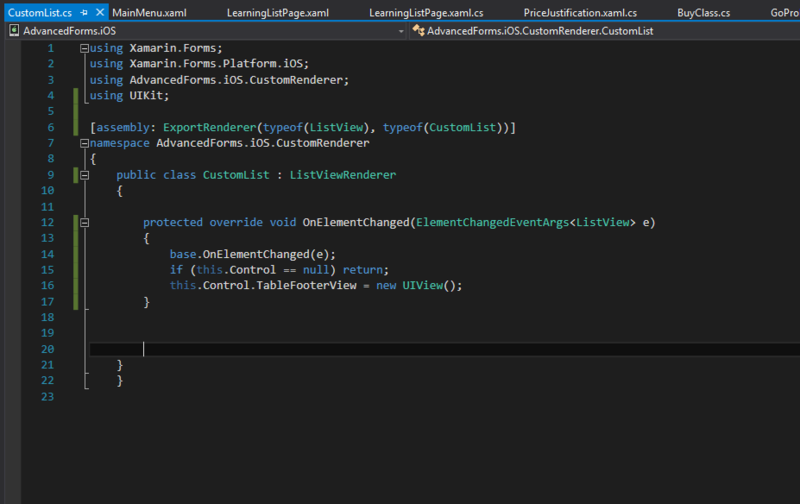 Just Add **Footer="" ** in Listview XAML, solved all my problems. Thanks @Charwaka, well done! After adding footer tag in listview, you also need to wrap the list in stacklayout.